Carnival’s nickname is the Fun Ship, and they are certainly meant for fun. But instead of its old image of scantily clad guests whooping it up on the Lido Deck, Carnival has been working to be a better fun ship for families, and Carnival Pride certainly is a family-friendly ship. Carnival Pride’s home port in Baltimore makes it very easy for families in the northeast to enjoy a cruise to the Caribbean. Just drive and park at port in Baltimore, hop on board, and make your way down the coast for a dose of sunshine. The long distance means you’ll spend a lot of time at sea, but Carnival’s budget pricing and onboard activities will make the trip worth it. 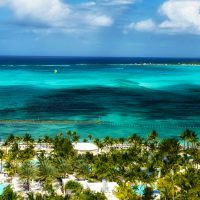 Once in port, you’ll have an array of excursions available to get a dose of the islands you’re visiting, mainly the Bahamas, but also lesser-visited islands such as St. Martin. 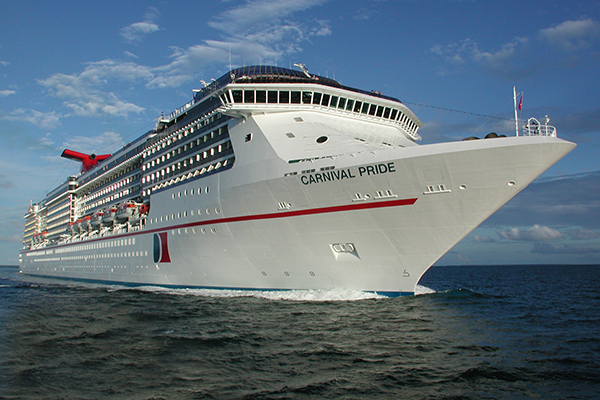 Carnival Pride is one of Carnival’s oldest ships in its Spirit Class. Launched in 2002, it carries more than 2,100 passengers. The only downside to our cruise was how dated the ship looks. It’s flashy light d?cor, worn brick-colored rugs and (we think cheesy) Italian god and goddess d?cor is begging for an overhaul. However, for the price, we didn’t expect a grand ship. Pride isn’t grand in terms of its entertainment, either. You will not find Broadway-style performances every night, but you will certainly have a good time. The ship is a great value for a family getaway, especially when winter blues are hitting and you just need some family time and sunshine. Carnival’s kids’ program is known as Camp Carnival, divided into small age groups, so children will have no trouble making friends their own age on board. Young children, ages 2 to 5, have their own play room, while kids ages 6 to 11 are just next door in their own room. Typically, the 9- to 11-year-olds are separated from the younger kids with activities that take place in various parts of the ship — mostly Beauties Nightclub, which becomes an open play space during the day. In the rooms, board games, video games, arts and crafts, movies and more can be found. Older kids will enjoy scavenger hunts, high-energy games and special events such as magic shows and dance parties. Older kids, with parents’ permission, may check themselves in and out of the club. For children ages 6 months to 2 years, the children’s programming is not available but babysitting service is provided at an additional fee. Camp counselors do not change diapers, so parents must return for diaper changes, including toddlers over the age of 2 participating in Camp Carnival programs. All kids’ programming comes to a halt at 12:45 p.m., so families can then spend time together with special events like Beary Cuddly Workshops, Hasbro Live Gameshow and family trivia. The kids’ programs often resume in the afternoon and provide a Kids Only Dinner for ages 2 to 11. Nighttime programming includes movies, video games and kids’ parties through 10 p.m.
For parents seeking kids’ programs for late-nights, Night Owls is available for children 0 to 11. This includes video games, movies, board games and such, but is not included in the cruise. The program is $6.75 per hour, per child, with an automatic 15 percent gratuity added. Located on a separate deck, Circle C is dedicated to pre-teens, ages 12 to 14. This lounge space offers video game space, as well as a neighboring video arcade that is so hidden, most adults never find it. Supervised activities takes place daily, with sports competitions and themed parties. The teen space for kids 15 to 17, Club 02, is found nowhere near the little kids, so the teens will feel separated and safe in a private lounge where they can watch movies and play video games. Supervised activities include trivia events, Guitar Hero “rock offs” and themed parties. The lounge also adds an element of cool with its bar serving “mocktails” and all types of non-alcoholic beverages. Green Eggs and Ham with the Cat in the Hat and Friends Breakfast is offered on the last sea day on the ship, with an early and late seating. Reservations for the breakfast are required and each person attending pays an additional $5, but it’s well worth the cost. Kids will meet and mingle with the Cat in the Hat, Thing One and Thing Two, and Sam from the classic Dr. Seuss tale, “Green Eggs and Ham.” Although the eggs aren’t served green, the whimsical breakfast menu does feature a dose of color, as the dining room is transformed with red and white striped tablecloths and Truffula tree puffs. Ship photographers are on hand to capture the moment, but the characters do allow parents to take pictures, and every kid has a chance to meet each character and get “autographs” (stamps) in an activity book presented at the start of the meal. In partnership with Dr. Seuss, Carnival offers a Seuss-a-palooza Parade with the characters kids know and love from Dr. Seuss’s classic books. Taking place once per sailing, the parade starts in the Atrium Lobby and ends in the Taj Mahal Lounge, where a special story time reading of “The Cat in the Hat” takes place. 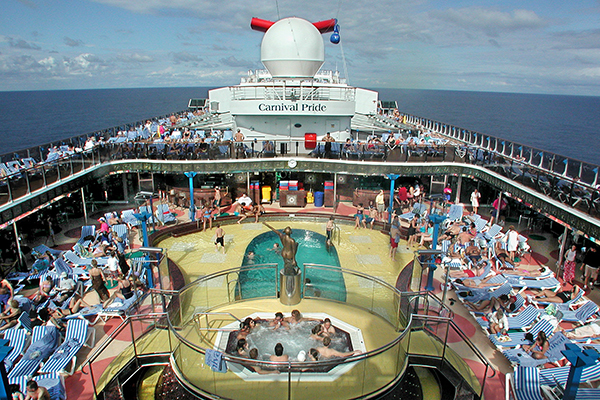 Carnival Pride has three family-friendly swimming pools: two on the Lido Deck and one wading pool near the waterslides. The Venus Pool is the open-air pool, while Poseidon Pool features a retractable roof for inclement weather. The Poseidon Pool also features a DJ spinning tunes, and in the evenings, becomes the home of Dive In Movies, with new release films that are rated PG or PG-13 offered nightly. Two waterslides are found in the aft deck area, with its orange slide a twisting tube slide and its green slide a drop slide that isn’t for the timid. If high winds are afoot, the slides will be closed, which, during our winter sail, was pretty much every day and a common occurrence, according to the crew. Dinner attire is either Cruise Casual or Cruise Elegant. Cruise Casual means no cut-off jeans, sleeveless shirts on men, baseball hats, flip-flops, swimming suits or gym/basketball shorts. Cruise Elegant is a chance to get all dolled up in your fancy attire; however, it is not required. 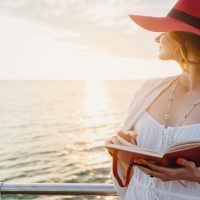 On these nights, of which there are two on a 7-day cruise, the above is not allowed in dining rooms, as well as jeans, T-shirts, sportswear or shorts. Kids’ menus are featured in the main dining room, Normandie Restaurant, and the fine dining restaurant, David’s Steakhouse. There is no additional charge for children at Normandie, but David’s requires a per person fee: for children under 12, it is just $10 and kids receive a starter, entr?e and dessert. 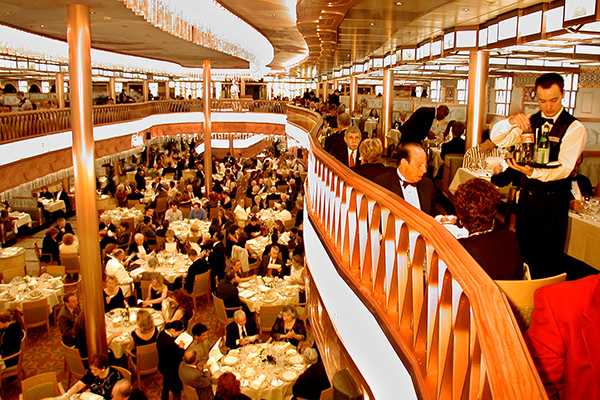 The dining room, located on Deck 2 and Deck 3, is the only main restaurant on the ship. Guests on Deck 2 enjoy set setting dining times at 6 or 8:15 p.m., joining other guests and having the same servers during the entirety of the cruise. Guests on Deck 3 enjoy Your Time Dining between 5:45 and 9:30 p.m., eating at whatever time they choose and sitting in different areas of the dining room. Normandie also opens for some breakfasts and lunches, depending on the day of the cruise. Guests receive an appetizer, entr?e and dessert. The fine dining restaurant open for dinners only is available for an additional charge of $35 per night. This excellent steakhouse features prime cuts and a great wine list and is well worth the price. Guests receive an appetizer, salad, entr?e and dessert. The buffet spot on the ship, Mermaid Grille, is available for breakfast, lunch and dinner, and features a number of “stations” for a wide variety of cuisine options. Chopsticks provides an Asian option, while the Carvery is a traditional roast beef carving station. At the very popular Pirate Pizza, you can get handmade, thin-crust pizza 24-hours a day. For desserts, the Sweet Spot will hit the spot, while the Carnival Deli features overstuffed sandwiches. Water, lemonade, iced tea, hot chocolate and coffee are included all day, and your family will be hard-pressed to pass on the free soft serve ice cream available. Located near the main lobby is a sushi bar and Asian restaurant, with meals available a la carte at an additional fee. Sushi and sashimi start at $1.50 per piece. The only celebrity chef restaurant featured on the ship is TV personality Guy Fieri’s famous burger joint featuring massive hamburgers and French fries so good, they are addicting. The quick-service station is on the Lido Deck. In the shopping area of the ship is a very small candy store, Candy on Top. Although it’s small, kids will not miss the colorful candy bins and oversized lollipops and will surely make a request or two for something to take home. Your cabin key is a combination photo ID, boarding pass and credit card, known as a Sail & Sign card, which allows you to charge anything to the card you purchase on ship. Kids can have spending privileges, or you can restrict the cards so only parents may charge. The ship is a smoking ship, and smoking areas include the casino, evenings in Beauties Nightclub, and many of the deck areas. Laundry service is available with user-operated machines located on five decks. Each deck only offers one washer and one dryer, and costs $3 per wash, and $3 per dry. Soap is available for purchase. The ship also will wash clothing for $15. A medical center is available 24 hours per day. ATMs are located on the ship, providing U.S. dollars. Gratuity is $12 per person, per day, and is automatically added to your bill before disembarkation. This gratuity is divided between the dining room, stewards and alternative services. A 15-percent gratuity is automatically added to your bill for spa services, bar tabs, and additional food costs. You are welcome and invited to leave more at any time. It is customary for guests to provide an additional cash tip to their steward and servers at the end of a sailing. Internet is good and available on the ship at a fee. Basic Wi-Fi for social media apps only is $5 per day or $25 for a weeklong cruise. The Value Plan provides e-mail, news, web surfing, etc. for $16 per day, or $60 for the week. For video streaming, it will cost $25 per day or $99 for the entire cruise. The Wi-Fi is available for only one device at a time; if you require additional devices per cabin, you’ll need to order additional packages. 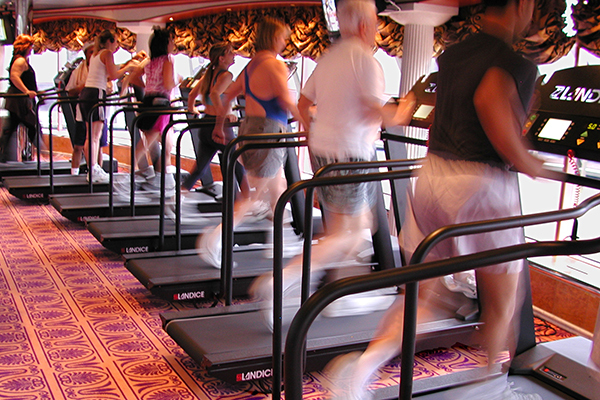 A fitness center is located on the ship with weight-training and cardio equipment and locker rooms. A small walking/jogging track is located on Deck 10, but is closed during strong wind days. The ship’s Forward deck features the Serenity adults-only area for ages 18 and older. The area features covered and uncovered seating, including hammocks, lounge chairs, couches and hidden nooks, as well as a bar, small swimming pool and hot tub. During sunny, warm days, the chairs go as early as 7 a.m. and it’s difficult to find a spot to enjoy the quiet, but if you’re one of the lucky ones who do, be sure to enjoy it! Spa Carnival, located on Deck 9, features a number of treatment rooms for full body treatments, massages, facials, scrubs, and more. Neighboring the spa is a beauty salon for hair and nail treatments.